Although the 1974 World Cup will be remembered for West Germany lifting the trophy that anointed them champions of the world, it also marked the explosion of two teams into international consciousness, each who may have claims to being better than the tournament’s eventual winners and, who on another day could have reasonably expected to overcome the tournament hosts. Each also had an outstanding star player who many would consider the outstanding player of the tournament. In the final, the Germans defeated the Dutch team of Cruyff and Michels’ totaal voetbal in a game that looked destined to go the way of The Netherlands after an early goal had put the Oranje ahead, but as they spent time admiring themselves in the mirror, they got lost in their own swagger, whilst Helmut Schön’s team equalised and then snaffled the trophy away. The other team possessing that authentic look of potential world beaters also lost to the Germans. They succumbed in the game that took the hosts into that Munich final against the Dutch. Although the denouement of a second group stage rather than a semi-final per se, the 1-0 German victory had a similar effect. The team they had vanquished was Poland, who had amongst their number the player who would be the tournament’s top scorer, and winner of the Golden Boot. If some would consider the fame duly accorded to the cult of the Dutch entirely worthy, the success of the Poles was perhaps much less celebrated. Nevertheless, Paul Breitner reveals the worth of the opponents in the encounter that took West Germany to the World Cup Final. “I can remember one game where I’ve always maintained we beat a team which was fundamentally better than us,” he reflected years later. “In fact, it was definitely the best team in the competition and still didn’t win the World Cup. I mean Poland in 1974.” Now, some would consider that the compliment also concealed a backhanded jibe against the Dutch as the Germans’ rivals at the time, but even giving a nod to that potential bias, there’s a clear and substantial respect for the Poles and, by association, their leading goalscorer Grzegorz Lato. Grzegorz Bolesław Lato was born in the northern Polish town of Malbork in 1950, and from 1966 to 1980, played for a single club, Stal Mielec. With a natural ability to beat a player on either side, plus a searing turn of pace and a goal scorer’s instinct to be in the right place at the right time, he became a key player for the club and won league championships in 1973 and 1976. Lato’s contribution to the cause becomes self-evidently clear, when it is noted that he was league’s top goalscorer in 1973, netting 13 goals for the team. Lato even ventured into European competition with Stal in the 1975-76 season, reaching the quarter-final of the UEFA Cup. In total, across his fourteen years with the club, he would appear in 272 league games, scoring no less than 111 goals from a wide position. Couple this with his achievements in 1974 and the fact that he also appeared in the following two World Cups as well, and the inevitable question arises as to why he didn’t move to a bigger club earlier in his career. He eventually left Stal in 1980 to move to Belgium and K.S.C. Lokeren – reportedly after turning down an invite from no less a player than Pelé to move to New York Cosmos. It was hardly the ‘major club’ that his exploits up to that time may have suggested he would warrant, but the Polish League’s policy of prohibiting any of its players moving abroad until they were 30 years old, stymied hopes of a move to one of the continents mega-clubs. Starved of the chance to demonstrate his skills in the continent’s biggest club competitions, Lato would have to satisfy himself by being his country’s shining light in World Cups. It was something he took full toll of in the 1974 tournament, and his exploits led to him being renown back home as ‘Ulubiony Piłkarz Polski’ (Poland’s Favourite Footballer). It’s often been said that English football has an arrogance about it concerning the national team, and an inflated idea of their position in the world game, especially when compared to some Eastern European or Latin American countries outside of the duopoly of Brazil and Argentina. Such being the case, when called on to qualify for a World Cup Finals for the first time in a dozen years, there was plenty of positive expectation when Sir Alf Ramsey’s team was slotted into a group with Wales and Poland. Despite a victory in Wales, a failure to defeat the same team at Wembley and a disappointing defeat to the East Europeans in Chorzów when Alan Ball saw red, meant only a victory over the Poles at Wembley in the final qualifying game would see England qualify. All England fans of that particular vintage know what happened next of course, when despite a preponderance of attacking possession, a breakaway goal saw the visitors ahead and despite an equalising penalty from Allan Clarke, England couldn’t find the win and, whilst England stayed at home and waved goodbye to Ramsey, Poland went to Germany in their stead. In reality however, that outcome should not have been a surprise. Understandably perhaps, the ‘golden glow’ of 1966 was still dazzling the eyes of the vast majority of England fans and, to a large extent, even the cognoscenti of football pundits in the country, blinding them to a less optimistic reality, that a more dispassionate reflection on form would have revealed. Simply put, Poland were probably favourites to qualify from the group despite the fact that a home win in the last game of the group would have seen England home. That game however was almost a perfect situation for the Poles. Not only was Kazimierz Górski’s team set up to defend and hit on the break utilising the startling speed of Lato, Robert Gadocha and Jan Domarski, who netted the vital goal at Wembley, England came into the game full of bluster and over confidence after destroying Austria 7-0 a few months earlier. The circumstances played in to Polish hands. The other factor that slipped past so many of the people expecting an English victory was that Poland were reigning Olympic champions, having secured the gold medal in Germany two years earlier, where a 22-year-old Grzegorz Lato made his bow in a major international tournament, gaining his third cap as a substitute. He would go on to make that figure up to 100 by the time he retired in 1984 having scored 45 times for the national team. By the time the qualification for the World Cup rolled around, not only were Poland a mature and confident team, but Lato’s ability and goal scoring had also made him a fixture in the team. He had already netted a brace against Bulgaria in a friendly, and then added another in the home qualifier against Wales. The 1974 World Cup would be the platform upon which he would announce his name to the footballing world. Poland were certainly not given an easy ride in West Germany, when they were pitched into Group Four, alongside the traditional powerhouses of Italy and Argentina, plus the unknown and little regarded minnows of the four, Haiti. It’s not stretching things too far to suggest that the ‘smart money’ would have the Azzurri and the Albiceleste fighting it out for top spot with the other as runner-up, Poland in third place and Haiti bringing up the rear. For such expert opinions, however, there was a reckoning to come, much as that endured by England supporters the previous year. Facing the Argentines in Stuttgart on 15 June, Poland, and Lato in particular, were about to display their prowess for all to see. Strangely forsaking their traditional red colours, Poland wore all white, and within ten minutes were two goals ahead. As early as the sixth minute, a corner from the left was flighted into the Argentine box. Seeking to come and collect, goalkeeper Carnevali bundled into one of his own defenders and spilled the ball. With instincts blaring, Lato was first to react and fire home. What would become a familiar goal celebration, running and punching the air as he jumped with the locks from his prematurely receding forehead trailing, was displayed for the first time in a World Cup. It wouldn’t be long before the Poles struck again. Once more, Lato was at the centre of things. The Argentines were trying to clear their heads after the early goal with some controlled possession, but a stray pass found its way to Lato just inside the Poland half of the field. Kicking in the afterburners, he surged at the heart of the defence, drawing defenders to him akin to iron filings attracted to a magnet. Using the space created by the mayhem caused by Lato’s thrust, a run through the inside left channel by Andrzej Szarmach saw him clear on goal if only Lato could see, and then accurately deliver, the pass. It was never in question. Szarmach collected and closed in on Carnevali before firing past him to double the lead. Lato had struck at the Argentines twice in just over a minute. After the frantic opening, things then settled down as Argentina probed and looked for openings within the Poland backline, but without avail, always being aware of the wing-heeled counterattacks that Lato and his team had in their locker. At the break the lead remained intact and coming out for the second period, Argentina surely knew that the onus was on them if they were to get back into the game, and if pressing further forward left gaps, it would be a gamble they may have to live with. And so it was, with the Poles massed in defence, a Kempes pass to the left found Heredia, who hit from distance past Jan Tomaszewski to bring the South Americans back into the game. It wouldn’t take long however before another error from Carnevali would negate any hopes of a comeback. Less than two minutes after Heredia’s strike, the Poles won a free-kick about 25 yards or so out from goal, and broadly level with the left edge of the penalty area. As Welsh referee Clive Thomas tried valiantly to encourage the Argentina defensive wall to retreat the requisite ten yards, skipper, Kazimierz Deyna, rolled the ball sideways for giant centre-back Jerzy Gorgoń to run forward and power in a shot. Although firmly struck, it was almost straight at the goalkeeper and Carnevali coolly saved and then looked to begin an Argentine attack. Throwing the ball out to his left, however, he had reckoned without the razor-sharp wits of Lato. With anticipation as sharp as his feet were swift, he intercepted the ball and drove into the Argentine box. The angle was very tight however and a cross towards a supporting team-mate looked like the best option. Instead, though, he lifted the ball over Carnevali and into the net. It was the decisive moment of the game. Although Carlos Babington pulled a goal back on 66 minutes, after the sort of goalmouth scramble that Tomaszewski had almost made his own at Wembley, the Poles held on for the victory, largely earned by Lato, and won out 3-2. At the same time, Italy were beating Haiti 3-1 after amazingly falling a goal behind. Four days later, Italy and Argentina played out a 1-1 draw that really did little to enhance the qualification aspirations of either as at the same time Poland rattled no less than seven goals past the hapless Haitians, with Lato’s brace both opening and closing the scoring. It meant that Poland were clearly in the box seats on four points from their two wins, plus having a bumper goal difference. The Argentines had a single point, but with Haiti to play and Italy had three points but had to face Poland in their last game. Lato’s four goals and assists had put his team onto the cusp of qualification. Avoiding defeat against the Italians would surely be sufficient to top the group. They would do better than that though. On 23 June, Argentina duly despatched the Haitians 4-1 and Italy faced Lato and the rampant Poles. A late goal by Fabio Capello just five minutes from time did little to deflate the Polish joy as they cantered to a 2-1 victory to finish at the top of the group with a 100% record. The Azzurri went home with a bad case of the blues. It was a remarkable performance given the strength of the opposition, but the Poles were a long way from thinking their journey was anywhere near over. In the next group stage, after missing out scoring against the Italians, Lato would again enter centre stage. The second group phase placed Poland against Sweden, Yugoslavia and the hosts, with their last game being against West Germany. On 26 June, after the Germans had defeated Yugoslavia 2-0, Poland faced Sweden. It was a game settled by the predatory instincts of Lato two minutes ahead of the break. A cross to the far post was headed back across goal and reacting quicker than both goalkeeper and defender, Lato darted in to head home the only goal of the game. A penalty save by Tomaszewski in the second-half, diving to his left to deny Staffan Tapper, merely confirmed to the Swedes that it wasn’t to be their day. Four days later, Poland faced Yugoslavia in what, to all intents and purposes, was a quarter final game. Victory would guarantee the Poles a chance to play West Germany in the last game with the prize being a place in the World Cup Final. At such times, a team depends on their big players, and Lato would not be found wanting in his country’s hour of need. After 20 minutes of feeling each other out, a clumsy challenge in the Yugoslavia box saw Andrzej Szarmach tumbled and a penalty awarded by East German referee Rudi Glöckner. After much delay as the referee sought to keep players outside of the area, Kazimierz Deyna converted, firing low to the goalkeeper’s left. The Yugoslavs were a more than decent team however, and if some thought the goal would see a collapse of the opposition, they were to be proved wrong. A nine-goal victory over Zaire, coupled with draws against both Brazil and Scotland had seen them top their initial group, losing to the hosts in their opening game of the second phase, they knew that a further defeat would end their journey. Just before the break against the Poles, a neat piece of interplay saw Stanislav Karasi clear in the box. A cool sidestep around Tomaszewski opened the goal up, and he joyfully smashed the ball into the roof of the net. It was a goal of rare quality, and now Poland had it all to do again. It was time for Lato to make his telling contribution. Just past the hour mark, a corner from the Poland left flank offered up the opportunity. Alive to the options, Lato made a run to the near post. The cross was flighted in perfectly for him to nod home. It set the Yugoslavs back in their tracks and needing to come from behind again. This time, they came up short. Later the same day, West Germany defeated Sweden 4-2 to set up the ‘winner takes all’ last game against Poland. Due to their superior goal difference, a draw would be sufficient to get the Germans through to the final, but to do so, they would need to control the ebullient Poles and particularly their Mercurial striker, Grzegorz Lato. It was a game that promised so much, but in the end was largely decided by events outside of the capabilities of either team. The whole tournament had been blighted by bad weather, with many games played out on sodden pitches, very much in contrast to the tournament in Mexico four years earlier, when a relentless sun illuminated the football. For this most important game ahead of the final, however, the weather took on an even more intensely dark demeanour. Up to that time, Poland had never beaten the Germans and the conditions seemed to conspire to maintain that record. Poland’s free-flowing and swift passing game was hardly going to be suited to a cloying surface, and their optimism, boosted by victories and goals, would surely have been dampened by the wet conditions. Things got so bad that at one point it seemed likely that the game would need to be postponed, but with schedules dictated by television and money, that was never really an option unless it would prove impossible to play. Just minutes before the scheduled kick-off, officials were seen throwing balls into the air, that then landed with a splash rather than bouncing off the surface. Delay was inevitable, postponement became increasingly likely, but the appointed referee, an Austrian named Erich Linemayr, insisted that the game would go ahead no matter what. For the next half-hour or so, heroic efforts by ground staff with rollers, brushes, forks and other agricultural implements, assisted by local fire crew, did what they could and 31 minutes later than scheduled, with players’ nerves now frazzled by the delay and a crowd drenched by the downpour, the game got underway. Although the playing surface had improved, it was a case of being in a slightly less bad condition, than actually being better. Both teams were compelled to forego any pre-game plans and adapt to the surface that almost precluded turning without slipping. Play the way you are facing and keep the ball in the other half of the field seemed to be the dominant requirement. Anything more technical than that was waterlogged folly. There’s little doubt that it was the Poles’ game plan that suffered more, but despite this they pressed the home defence with vigour. One occasion probably told them that this wasn’t going to be their day though. A goal-bound effort stopped dead in a pool of water in front of the German goal with the net gaping invitingly. On any other day, the ball’s onward journey would not have been brought to such an abrupt halt. But on this Frankfurt summer’s day, it simply stopped and was cleared. Despite assistance from the pitch, Sepp Maier was still tested and by far the busier goalkeeper as Lato probed together with his team-mates. At the break however, the players retired to the dressing rooms to dry out with the scores level. Into the second period though, the seemingly inevitable happened, a clumsy challenge by Władysław Żmuda on Bernd Hölzenbein gave the Germans a penalty. Tomaszewski had already played his trump card by saving against Sweden from the spot in the previous game. He surely couldn’t do so again. Uli Hoeneß stepped up, but his effort was tame and again the goalkeeper, described as a ‘clown’ by Brian Clough, proved Old Big Head wrong. It would be the last time a German player missed a spot kick in anything other than a shootout until Lukas Podolski’s miss against Serbia 36 years later. By now, the play had turned much of the wet surface into mud and any attempts at football were being beaten into submission. Play became increasingly scrappy, with chances few and far between. In such an environment Poland and their star striker, despite being in an outstanding form up to that point, were almost impotent and, with 15 minutes remaining, the seemingly inevitable happened. A chance fell to Gerd Müller, and the Der Bomber’s finish destroyed Polish dreams. A brave flurry at the end saw half-chances come and go, but Poland’s greatest ever team, and their Favourite Footballer were defeated. Poland would go on to take third place after defeating Brazil 1-0, thanks to yet another Lato goal. It would be the country’s best ever performance in a World Cup. They would again reach the last four in 1982, again taking the bronze medal, but despite that side having the talents of Zbigniew Boniek, it was probably an inferior team to the 1974 vintage. Lato was still an important member of the squad but, now aged 32, his powers were on the wane. In 2004, UEFA composed a list of the top 50 European players. It is both surprising, and yet unsurprising at the same time, that Grzegorz Lato failed to make the list. Surprising because here was a player who not only played in three successive World Cups, being the tournament’s top scorer once and twice finishing in third place, but also picked up gold and silver Olympic medals. A number of players who made UEFA’s grade would have a much less successful career. Conversely though, his omission is hardly a surprise at all. 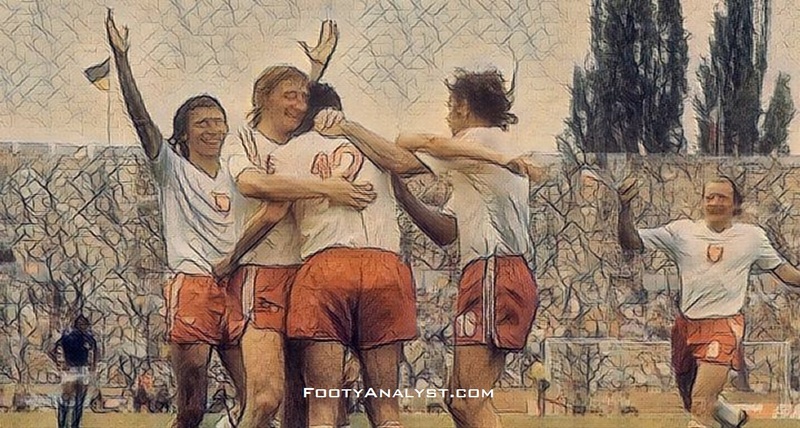 Not only were Poland disregarded when facing England back in the qualifying tournament for the 1974 World Cup, their success since has also brought little real regard. Whatever others feel about the career of Grzegorz Lato though, there is little doubt of the esteem with which he is held in his home country. That’s why he is heralded as Ulubiony Piłkarz Polski.